Some readers might wish to hear of latest pile of books I've been reading. A quick peruse of titles and highlights may be of interest on a cold November evening. Firstly, I was blown away by "Romance on Three Legs ~ Glenn Gould's Obsessive Quest for the Perfect Piano" by author Katie Hafner. It begins with the unpacking of the 68 cardboard boxes of Gould's worldly possessions at an Ottawa Museum, and the uncrating of the bizarre "pygmy chair" that Gould used. It then races through the most fascinating account of Gould's pianos, which had to have an incredibly light touch. Most fascinating is that blind piano technician who had to be at Gould's side almost constantly in Toronto, a man who is still alive and has given much time to telling exactly what happened to the piano that Gould played on in his recordings. And the technician's point of view of the complete rebuilding history of the particular Steinway piano that Gould did most of his recordings on is flabbergasting. I was riveted, literally, by what was technically done to his piano (sanding down of keys, lightening of the hammers, all to the point that no one else could play it without the hammers striking twice they bounced so wildly) and you've got to read about what happened to Gould's piano; you'll be astounded. I kid you not. Mind-bending. It reminded me so much of repeatedly sending a flute for repair and asking for "super light action, no I mean really super light action". Fascinating reading. Ten out of ten. And I had already read five other books on Gould and watched all his films on youtube!!! This story stands head and shoulders above any other Gould readings I've come across. Incredible. 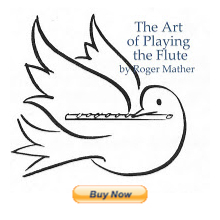 Paul Edmund Davies new book "The 28 Day Warm Up Book ~ for all flutists...eventually!" This is a spiral bound work book with practise plan that starts with sonority, then finger technique, articulation (mostly double tonguing) and then lip flexibility technique (leaping intervals smoothly). It has two pages of text for each chapter (very philisophical, light in tone, and helpful advice from Davies) and a practise plan that allows you to put all these techniques together in an hour or so warmup everyday for twenty-eight days. The piccoloist with the LA Philharmonic recommended this title as a great pre-audition work book: "Working Out, Working Within" by Lynch/Huang. Like other workbooks of this type, there are philosophies that really help your mental equilibrium when you're "in training" whether it's sports or the arts, plus meditations, affirmations, and lots of stories about famous athletes who centered themselves and ended up winning because they had a positive mind-set. I really enjoyed the philosophy portion, but felt like I was reading a daytime TV script when I read over the affirmations. No, I'm not in denial (ha ha! ), I'm just getting that "sugar coated" feeling and that can't be useful in Tao-ism. But it was "okay". I'm sure this 1997book will help alot of people. Naturally, as in my much loved Gallwey's "The Inner Game of Tennis" where you take the word tennis and exchange it for the name of your musical instrument (read flute instead of tennis throughout the book) in "Working Out, Working Within" you merely substitute "flute" or "music" for the words "sport" or "working out". These authors also penned the earlier volume "Thinking Body, Dancing Mind" which is also interesting reading. I've read books that are better written, but these are definitely EASY to read for the average student. The breathing technique that is repeated every 5 pages is actually a great one. So, I hope that my nice flutey readers will all suggest good winter's reading lists here on this blog! Just click on the comment button below and thanks. I usually read 4 books at a time. But this week I'm practising the Davies "28 Day" and so will continue doing that and report back while you think of books books books for me. Jen avid reader walking the middle way hahahhaha!